The jQuery Globalization plugin originally developed by the ASP.NET team and donated to the jQuery project, has found new life as the “Globalize” JS library. This new library is maintained by the jQuery UI team but no longer has a dependency on jQuery. It is completely standalone, meaning you can use it with any JS library or environment you like. That’s very cool. Moving forward, the jQuery UI library will utilize Globalize for providing globalization of the its widgets, and expose an API interface that can be met by Globalize while encouraging widget authors to utilize this API to ensure any widget can be globalized in the same way, with or without globalize.js as a depedency. That’s cool too. The library includes culture information for ~350 cultures. That’s quite a lot. And an interesting fact: these culture files are generated from the culture info in the .NET framework. That’s especially cool. You can grab globalize.js and the desired culture files from its home on the jQuery github account. It’s currently in “in development” status at version 0.1.0a1. You can read more about plans for its development and further releases on its jQuery UI wiki page. If you have any feedback or feature suggestions go ahead and leave a comment here. During my recent presentation to the Victoria.NET DevSIG on jQuery, I talked about how to get started using jQuery with ASP.NET Web Forms projects. 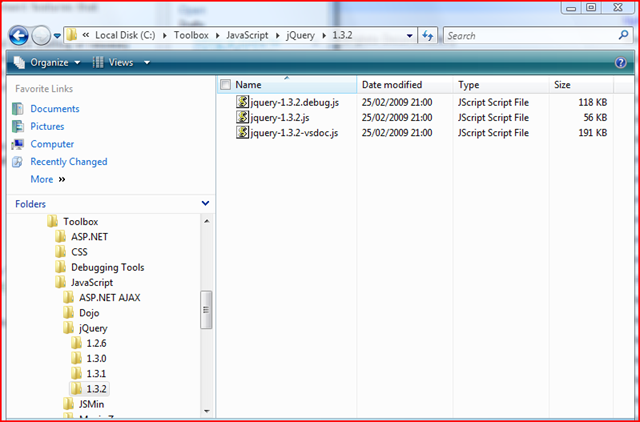 Part of this was around how I like to set up my projects with jQuery to take advantage of the script management features that ASP.NET & Visual Studio 2008 provide out of the box. When you download jQuery, you have the option of the standard file (jquery-1.3.2.js at time of writing) as well as the “production” file, which is minimised (jquery-1.3.2.min.js). 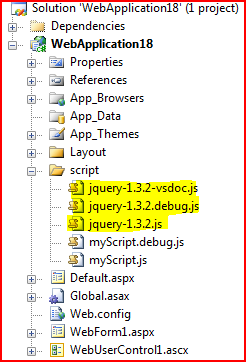 Microsoft have also contributed a VSDoc file which you can download from the official jQuery source repository on Google Code. It would be nice if the next version of ASP.NET included support for jQuery’s default file extensions in the ScriptManager control, but until then this works very well. I’ll be speaking at the Victoria.NET SIG meeting next week in Melbourne about jQuery. Come along if you want to learn about what jQuery is and how it can help you in your ASP.NET applications. RSVP details below. Damian Edwards has presented at several Usergroup meetings, community events and Tech Ed on a wide range of topics. He is also a Microsoft MVP who specialises in ASP .NET and Web Front end development. If you are planning on coming, please RSVP to help us organise drinks and catering. To register, simply send an email to info@victoriadotnet.com.au. It is a FREE event and there is no charge for attendance but space is limited so you’ll need to let us know you’re coming so we can make sure there’s space. If you do not wish to receive event notification mails in the future, simply send a mail to info@victoriadotnet.com.au with the word Unsubscribe in the subject. Damian Edwards is an Australian, living in Redmond, working on the ASP.NET team at Microsoft.